Adobe After Effects is powerful motion graphics and compositing software. Understanding each and every aspect of its features can take years. However, there are some fundamentals that even beginners should know. 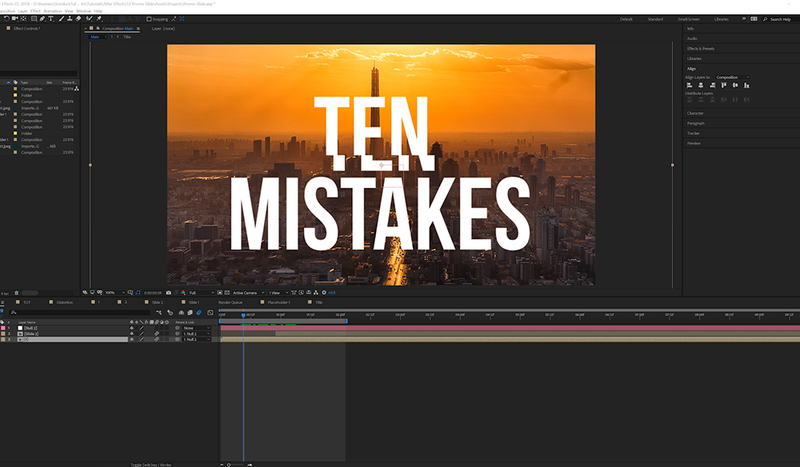 In this video, I go over ten mistakes that After Effects users should avoid. Motion blur allows you to easily make animations appear natural. Plus, motion blur is a great way to enhance your animated graphics when aesthetically appropriate. After Effects is a powerful tool that allows you to do practically anything in the worlds of motion graphics and non-3D VFX. It’s important for you to visualize what you are looking to create and be able to solve problems each step of the way. Sometimes it makes sense to use the regular linear keyframes. However, using “easy ease” keyframes allows you to quickly create natural movement within your animation. When compositing, feathering your mask is critical. You need your images to blend together and appear as one. Forgetting to feather your mask will not yield a convincing composite. When you need to create shapes for motion graphics, and you use a solid layer with a mask, you are totally missing out on shape layers. Shape layers allow you to neatly organize shapes, and they open up many ways of animating shapes. Color correction is its own art with its own rules and creative techniques. While you may not need to be a color correction expert, it is vital that you understand video scopes if you do need to color. Without video scopes, you are practically judging the images based off of your display. What looks good on your monitor may not look good on someone else’s. You’ve worked on a project that has hundreds of layers, and then your client asks you to change some titles. You then have to dig through your project, changing multiple titles that have been duplicating many times. With proper organization using “pre-compositions,” you can change the title once, and the entire project updates in a second. While this isn’t a bad thing to do when it makes sense, if you are not using the animate menu with text layers, you are missing out on control. The animate menu allows you to use advanced parameters to animate your titles, individual characters, and much more. If you use your mouse to center titles (or any other object in After Effects), you are bypassing the align tab. The align tab allows you to center or align layers to the left or right with a click of a bottom. Start being accurate with the align tab. The stroke effect is great at creating outlines if you have the mask. If you have the text layer or vector object, you can convert them into shape layers and apply “trim paths.” Trim paths allow you to cleanly animate strokes.